To me they are some of the most stunning and ubiquitous marine fishes in the hobby – No elegant Fish-Only tank set-up should be without a Butterflyfish or two. Butterflyfish prefer larger systems with places to get away from other fish. Chaetodontidae (means bristle teeth) species range from being extremely hardy and easy to care for to having very low captive survival rates. 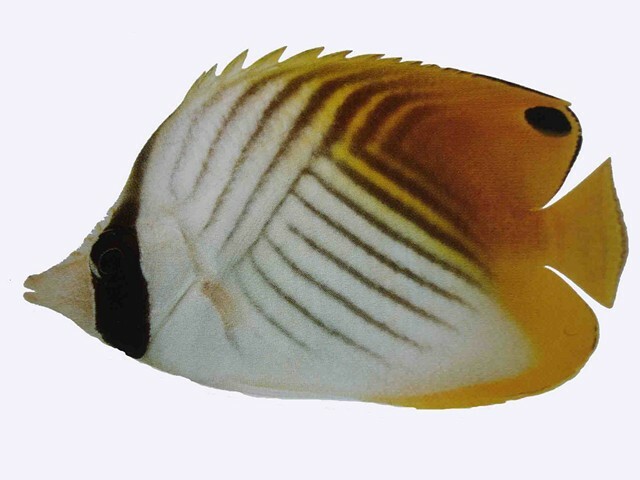 Most of the hundred-odd recorded species of Butterflyfish have very specific requirements which means they can often be hard for beginners to keep and are probably best not to purchase. These particular species can be very hard to feed, many of them feed on coral polyps in the wild and they will be among the first fish in your saltwater aquarium to be negatively affected if water quality drops. Many species are also are very timid, hide a lot and can be easily bullied by other fish. Also many species do not tolerate their own kind or similar species and can fight a lot. – These reasons combined with the fact that many Butterflyfish are not reef safe and will snack on invertebrates mean you need to choose the right Butterflyfish. Up to 90% of the above species will die after being wild-caught because they are so unsuited to captive life and/or eat mostly coral polyps and anemones; very hard for the home aquarist to provide! 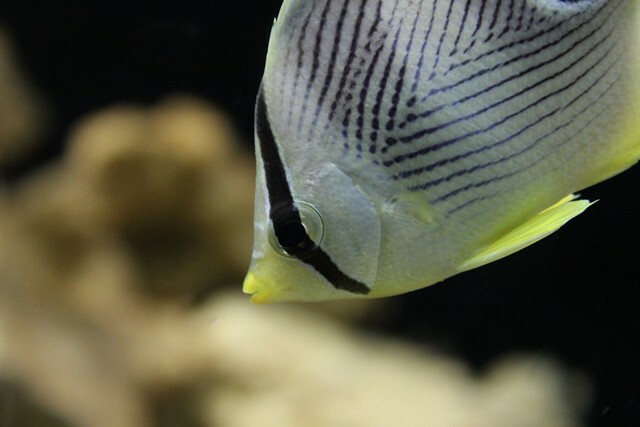 With attention to detail, close monitoring and a varied diet, a good Butterflyfish choice can thrive in your aquarium and are well worth the effort. The most common problem is dietary, some are very fussy and won’t accept substitute aquarium foods, so this means it’s very important to observe your potential fish feeding before buying it. Dont buy a too small (less than 2 inches) or too big (more than 6 inches) specimen as it will be particularly hard for them to adapt to tank life. Avoid individuals with any red areas around the mouth as these have been damaged during capture/shipping and may well not eat. 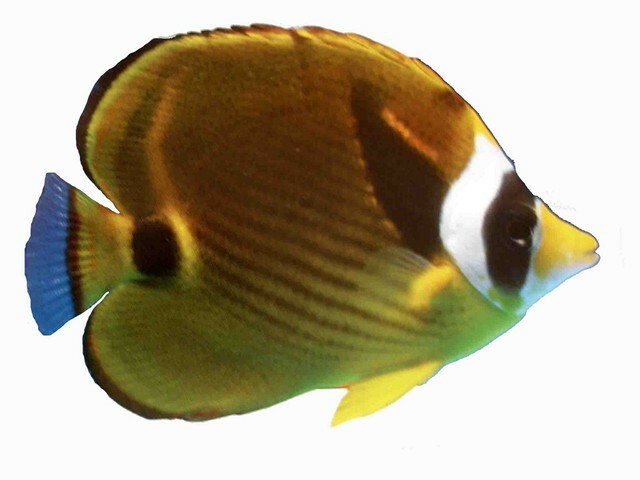 Dont purchase Butterflyfish in pairs or groups unless they get along well at the local fish shop. Always freshwater dip and quarantine new arrivals to your display tank. In the wild Butterflyfishes eat benthic algae, polychaete worms, nudibranchs, small crustaceans, zooplankton and coral polyps. They need a varied diet of brineshrimp, mysis, tubeworms, algae, shellfish and it is often recommended to feed them enriched forms if possible. It is a good idea to introduce them to your tank before more aggressive species such as Surgeonfishes and Tangs. They can be kept in fish only set-ups and fish only with live rock. Some can be kept in reef aquariums with care. They require water temperature of 26-28° C (79-82° F), pH 8.2 – 8.3 and Specific Gravity 1.021 – 1.024. Found in the Eastern Indo-Pacific, and grows to 20cm (8 inches). Can be a hardy species despite its reputation as hard to keep, as long as you provide a varied diet and supplement regularly with vitamins. A peaceful species that will become more confident with time in your aquarium. Will swim around the rocks and will generally ignore sessile invertebrates. Will eat Aiptasia anemones and sometimes they are introduced into aquariums to control these pests. 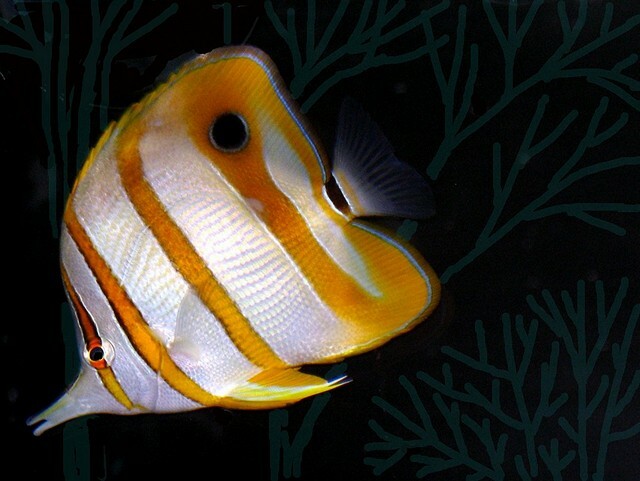 Excellent water quality will help you maintain this striking butterflyfish. 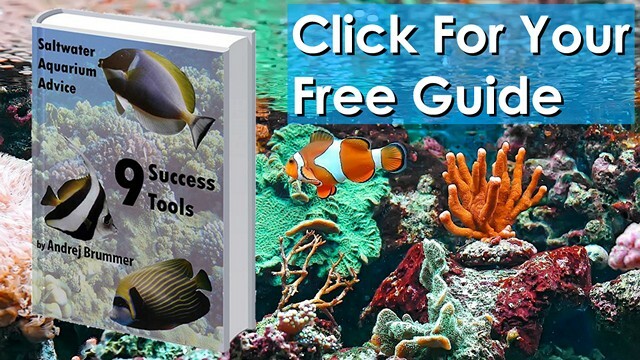 Don’t forget, if you would like access to my free ebook “9 Saltwater Aquarium Success Tools” to minimize mistakes and get your tank thriving simply click the button below. 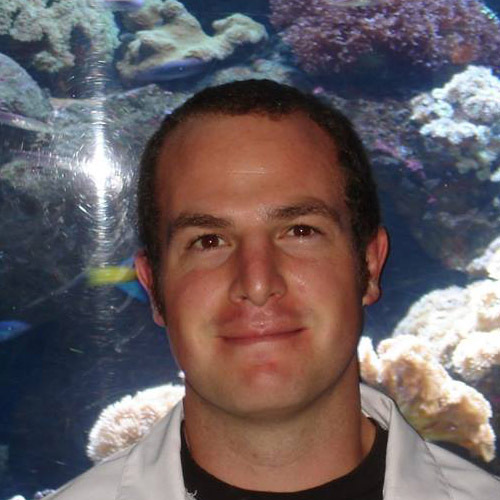 Hi I'm Andrej, a biologist, geek and best-selling author of 11 aquarium books. I love helping people minimize mistakes and create sustainable, thriving tanks. I believe all captive marine life should have the best chance possible if we take them out of their natural habitats. Are Quarantine Tanks Really Worth It? LPS versus SPS corals…which stony coral should you choose? Did you know fish size is a pretty important factor when it comes to choosing a healthy, tank-friendly specimen? It needs to be not too small or scrawny and not too big as these sizes are LESS likely to adapt to your aquarium conditions and more likely to be in worse shape after capture and shipping. Large wild caught specimens are also less likely to adapt to the change of diet in captivity and be more ensconced in their “wild” behavior. "Hey Andrej I just wanted to say that your articles are fabulous. It's like getting daily nuggets of aquatic reminders. People probably don't take the time to tell you how great these are so I thought I'd say something." "A truly outstanding read for anyone who has or is considering a marine tank. Clear, concise and very informative covering everything from the basic setup of a quarantine tank to managing a delicate reef tank and everything in between. Well worth the price." "We choose your products because we want all the best advice and help we can get, because as pensioners a saltwater aquarium is quite a big undertaking, but our only hobby and we love it. Thanks so much once again!" "This is a well-written, easy to follow book for anyone thinking about setting up a saltwater aquarium. The information contained in this book is invaluable! It is a must read if you are setting up or are new to aquaria!" "I just purchase your ebook and am enjoying it tremendously. We have... decided to add a saltwater FOWLR." "I have learned a lot from the book, and am still reading the second time around. Thanks heaps."